I went to the preview of the Pacific International Quilt Show 2017 last night. The Preview is an hour and a half long. 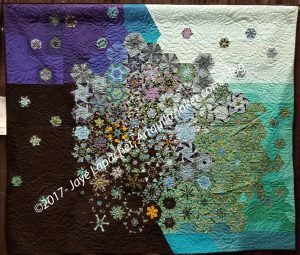 Preview attendees can look at quilts and interact with vendors as on the normal days. 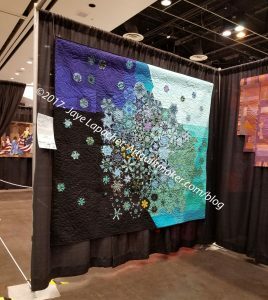 The bonus is that it is really empty, so it is much easier to take pictures of quilts that will be mobbed once the show opens. also, if you can find that one thing you want at a vendor booth, it will be there and you won’t have to fight for it. I did a quick survey of the vendors and, yes, bought a few things. I saw as many of the quilts as I could, but I really didn’t see anywhere near all of them. I didn’t get a chance to look at the special exhibits. I was really pleased to see some new vendors. I didn’t get to look at all of the wares the new vendors had available. I got an idea of what I might want to buy when I go back. I was disappointed by the New Quilts of Northern California. I didn’t see anything new and must not understand that point of that exhibit anymore. The Peacock was hanging there. I was pleased with the location. I was pleased to get a good photo of it.